Coming together with the other ladies of the Sweet Americana Sweethearts blog has been an amazing experience. And now, after months of discussion, planning and writing - we are all on pins and needles waiting to release the books! They will all be starting to go on pre-order over the next few days, so if you'd like to get them lined up and ready to be delivered to your Kindle as soon as they release, head to the Grandma's Wedding Quilts Amazon page, (just click the name under the titles of our books on Amazon and you'll get taken to the page!) - you can find all of the books that are already on preorder, and be notified of new ones as they're added! My book features some cowboys, and a lady who has to make a decision that I’m not sure many of us would ever be able to do…to dress up as a boy and head across country on a cattle drive with a bunch of cowboys. So how does a wedding quilt from Grandma tie into a book about cowboys and cattle drives? Well, the hero in my story, Jesse Attwell, is Grandma Mary’s first grandson. She’s been busy working on his quilt while he took this last big job, hoping to get enough money to pay for some land next to his family land, and right near his dear Grandma Mary. His sweetheart had finally given him an ultimatum - settle down and buy some land, or she’d marry a man who would. Grandma Mary started working on the quilt, believing he’d be marrying as soon as he returned. Imagine her surprise when he shows up with a tired woman who he feels an obligation to look after until her sister can come to get her. When Cora arrives, Grandma Mary offers her a place to stay for the night. While sitting next to the fireplace, she pulls out her quilt to work on - and Cora offers to help her. While spending some time with her, Grandma Mary realizes something…and finally understands why her heart felt that the Irish Chain pattern was meant for Jesse. Of course, you’ll have to read the book to find out why! I’m like a few of the other authors in the series, who has to confess to not knowing a great deal about quilting, so it was fun to do the research and learn a bit more. The Irish Chain patterns are striking and beautiful - and can be in a single chain up to an intricate three chain pattern. I had a Great Aunt who made quilts, and I still have the wonderful one she made me when I was just a child. She’d used old scraps of fabric, and that quilt covered my bed the entire time I was growing up. Some of the squares had started to fall apart and fray because it had been washed and loved so much. I imagine the love that went into making this quilt for me, was the same as the love Grandma Mary is putting into all of the wedding quilts for her grandchildren. And, I’d imagine they’ve all held onto those priceless treasures, passing them down through generations. 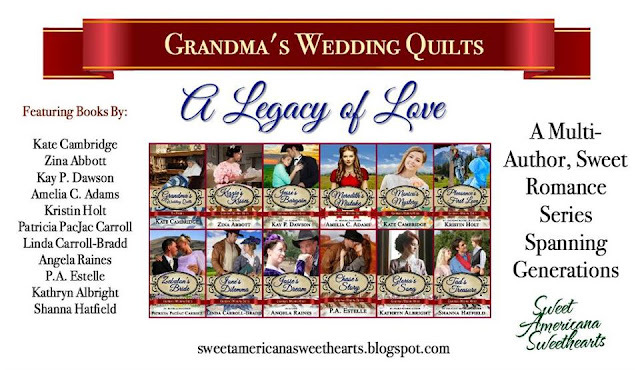 We all hope you enjoy this new series - it is truly one of a kind, and we have stitched the stories together to show the love of Grandma Mary, and how these quilts have touched the lives of the people who you will meet in our stories. 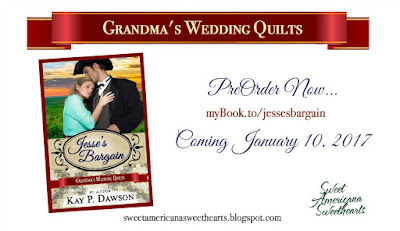 Jesse's Bargain is now available for preorder...click here to get your copy! Can't wait to read this series. I love quilting and miss it since I can't use my hands well. Thanks for writing this series ladies. 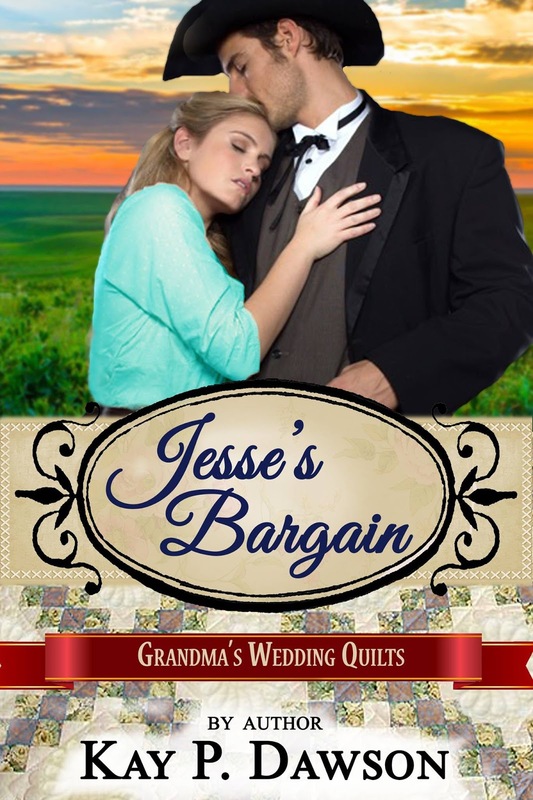 Jesse's Bargain sounds like a fantastic read! Can't wait for it to be released! I loved Jesse's Bargain! Thanks for letting me preview it!